Ah, the Ancient Greeks….those wonderful, gnarly great-grandfathers of Western Culture. (Or is that great-great-great-great-great-grea-great-great grandfathers?) The Greeks built an enormous, complex civilization which became the basis for today’s Western art, architecture, theatre, and philosophy. While much of what they created has been lost or destroyed by zealots, the Greeks did leave behind some pretty bangin’ shiznit, including some fantastic ruins. 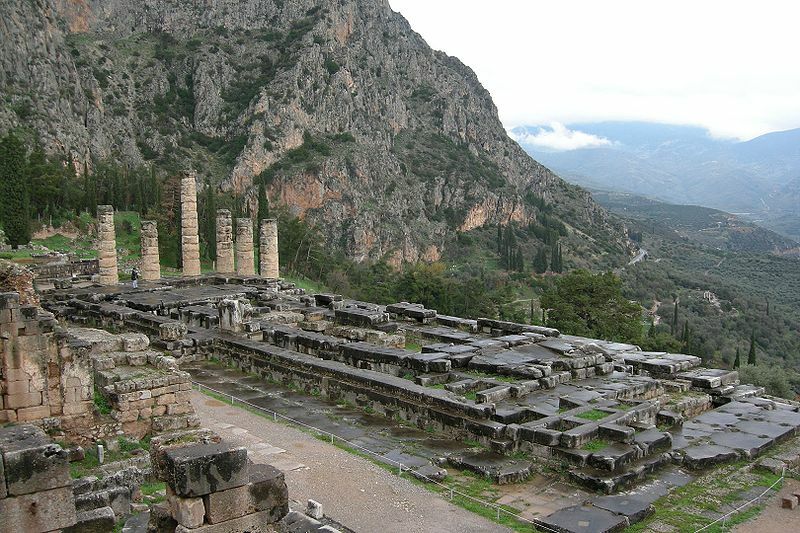 Few of these ancient sites hold more importance than the Temple of Apollo at Delphi. Considered the site of the omphalos – or “navel of the world” – by many Greeks, Delphi is most well-known as the home base of the Oracle of Delphi. So, WTH is an oracle? Well, in Ancient Greece, an oracle was essentially a wise person or a prophet. The Greek god Apollo – known as the god of light, sun and general bada$$ baller – was one of the most important gods in ancient Greek culture. He is said to have spoken through his oracle at Delphi. Known also as the Pythia, the Oracle of Delphi was chosen from the older female peasants in the area and was required to have led a “blameless life.” So, you gotta know that all the female peasants in Ancient Greece would have been throwing elbows and pulling hair to land that gig! #amiright?!? According to legend, it was at Delphi that Apollo slew Python and its body fell into a fissure in the earth. Some researchers believe that during religious ceremonies, the oracle sat above this gap and became intoxicated by the fumes of Python’s decomposing body. Now “possessed” by the spirit of Apollo, she would then give a tremendously mind-blowing performance of his word. Some researchers believe that these fumes were the result of ethylene gas which is known to cause violent hallucinations, although this theory is still up for debate. The foundations of the Temple of Apollo at Delphi remain standing today. Situated along the southern slope of Parnassos Mountain, the temple was first built around the 7th century B.C. After being destroyed by fire in the 6th century, it was rebuilt. Destroyed again in the 4th century B.C., this time by an earthquake, the temple was rebuilt for a third time. The area was eventually conquered by the Romans, who left the temple standing and the oracle in place. In order to eliminate all remnants of paganism in the territory, the temple was destroyed again in 390 A.D. under the rule of the Christian emperor Theodosius I. Yet, parts of the Temple of Apollo at Delphi still stand. It is going to take more than almost 3,000 years of war, earthquakes, and conquering religions to take this bad boy down! The Temple of Apollo featured 6 Doric columns in the front and back along with 15 on each side. These columns were made from Corinthian limestone. The imposing columns measured 1.6 meters in diameter by 10.7 meters high and were covered in a white stucco believed to be made from marble dust. Like the Parthenon in Athens, the roof is believed to have been made of solid marble. This roof would have been supported by beams of cyprus wood. Although we know little about how the interior of the building was laid out, it is believed that Doric inscription “Know thyself” was carved into the temple. While the Temple of Apollo at Delphi is neither the only temple dedicated to the god nor the largest ancient structure still standing, it remains a wonderful example of a Pan-Hellanic temple. To this day, it remains one of the most important places in Ancient Greece. 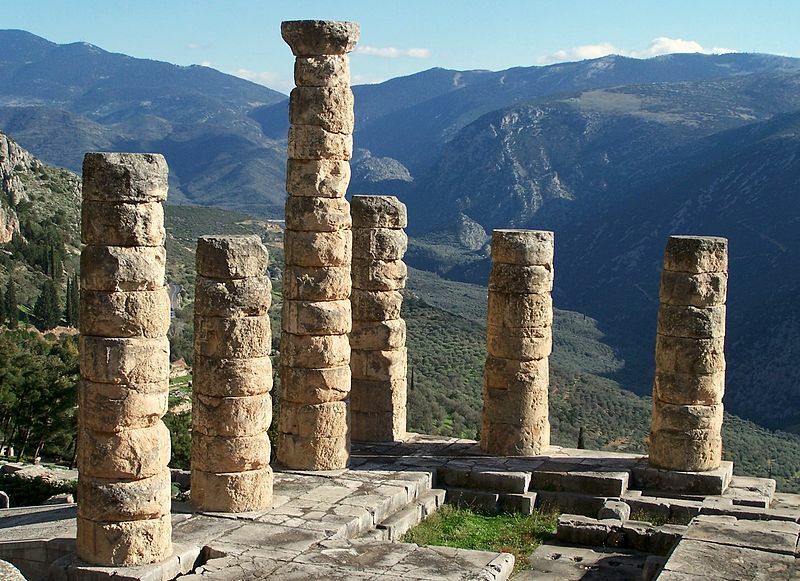 Surrounded by the ruins of the ancient city and set in a beautifully intact natural setting, a trip to the Temple of Apollo at Delphi is well worth a visit. I would love to go to Delphi! When we went to Greece a decade ago we focused more on island hopping, but we really loved learning about Ancient Greece and so our next trip will surely have Delphi as a stop!